This picture is a bit misleading because I cheated and used vac-packed ready-cooked chestnuts, but if you’d like to start from scratch and roast your own, have at it. To do this, heat your oven to 200C/400F/Gas Mark 6. 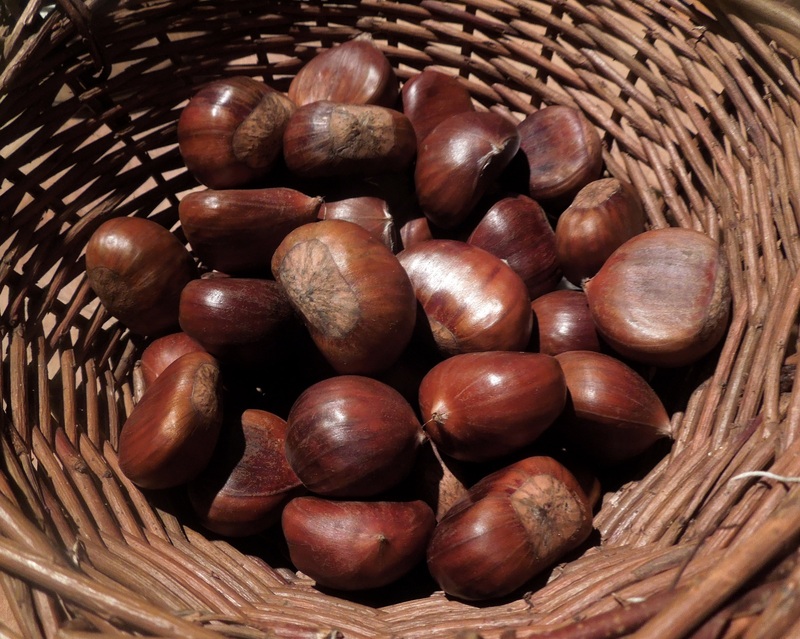 Cut a cross with a sharp knife into the skin of each chestnut, place in a single layer in a roasting tin and bake until the chestnuts split and the insides are soft, around 30 minutes. Peel off the outer and inner skins as soon as they’re cool enough to handle. If you let them get cold they’re a nightmare. Trust me, been there, done that. About 450g of shell-on chestnuts should give you 300g peeled weight. Roughly. The soup, either way you make it, sums up autumn for me. Woodsy, earthy and sweet by turns. Eat it as a starter or a light main course, preferably with some crusty bread. Heat the oil in a large pan, add the onions and celery, sprinkle with a little salt and pepper and fry gently until soft and golden. Add the garlic and cook for a minute or two more. Now throw in the sliced mushrooms and cook, stirring occasionally, until the mushrooms have wilted, about five minutes. Roughly chop the chestnuts and add to the pan with the thyme, stir well, then pour in 900ml of the warmed stock. Bring it to a boil and simmer for about 15 minutes or until the onions and celery are soft and the flavours have blended. 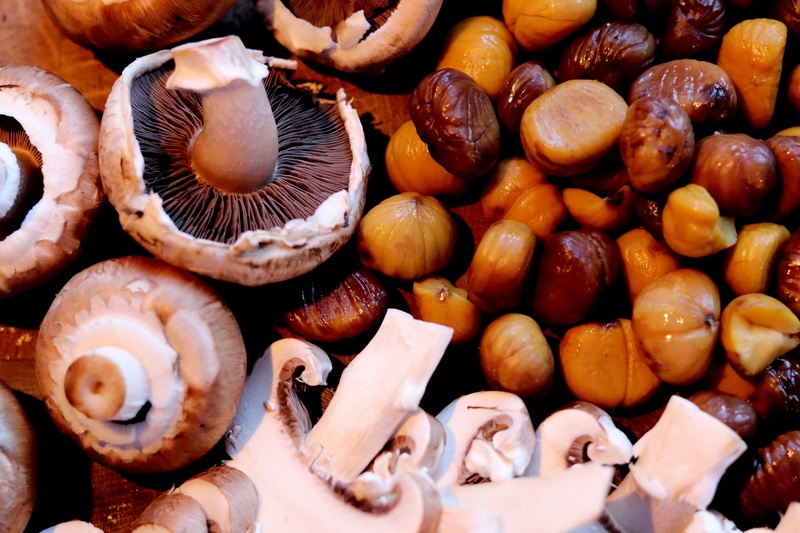 Remove from the heat and when it has cooled somewhat, pour into a liquidiser (you may have to do this in batches) or use a hand blender and whizz until you have the texture you prefer – I like it smooth, you may prefer to have some chunks of mushroom and chestnut. Put the soup back into the cleaned pan and check the seasoning, adding the reserved stock if it’s too thick. Stir in the parsley, if using, and re-heat gently. Thinly slice the reserved raw mushroom and float a piece on top of each bowl, with a scattering of parsley. 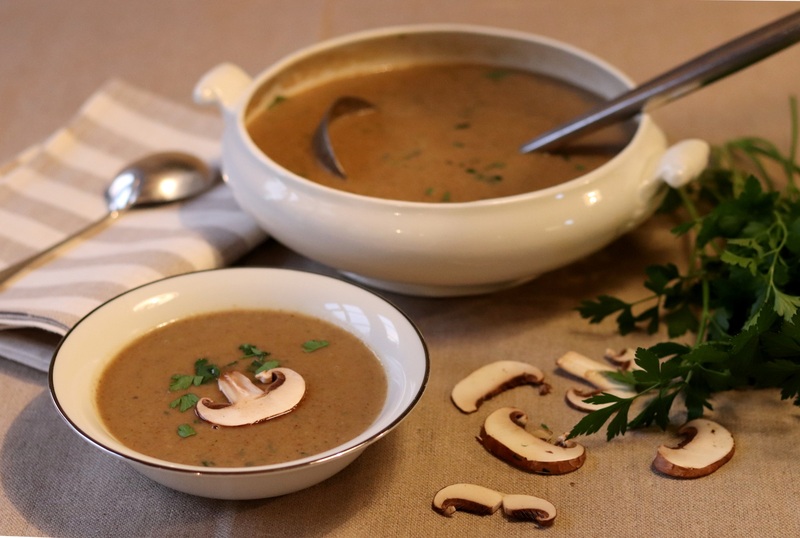 This entry was posted in Soups, starters and canapes, Vegetarian and tagged autumn recipes, chestnut and mushroom soup, vegan by Linda Duffin. Bookmark the permalink. Mmmm. Perfect for this misty moisty day. Thanks, Margaret. Yes, it certainly hits the spot, so comforting. This sounds earthy and very autumny, but then I have this thing about mushrooms. It’s no problems getting raw in the shell chestnuts here, but what a pain to peel. I’ve not seen the vac-packed ready-cooked chestnuts, but I haven’t looked. Now I have a new ingredient to search for, what fun. Ha! Geography! If Ron in Sweden has difficulty in accessing chestnuts methinks you will believe I am in far worse a state in semi-tropical Australia 🙂 ! Just looked up the two largest supermarket chains – was kindly offered water chestnuts (for Asian cooking) or chestnut dye from a dozen firms to colour my hair !! Loved them in Europe but will have to file this delicious offering till find some privately . . .
Oh, what a pain. Could you perhaps source some online, Eha? This really is autumn in a bowl, isn’t it? I love those tastes. As for the chestnuts, I do love them roasted, but I save that for eating them hot from the fireplace. When cooking with chestnuts, I do the same. Like a warm autumnal hug! Thanks, Frank. Yes, I agree with you about eating them straight from the brazier or fire … I love a hot bagful from the street vendors on a frosty day.